Left: Depiction of the Butcher and the Beaver in the illustration by Henry Holiday to the 5th fit The Beaver’s Lesson in Lewis Carroll’s The Hunting of the Snark (1876). The cutter of Holiday’s illustration was Joseph Swain. I think that Louise Schweitzer is right. 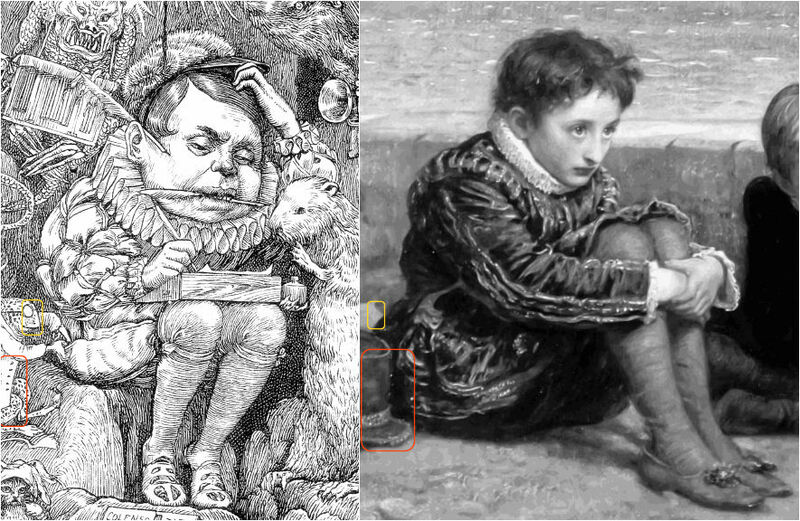 In Holiday’s illustraton not only the ruff was inspired by Millais’ painting. As so often in Holiday’s pictorial Snark conundrums, in this pair of images we find a resemblance of shapes and their re-interpretation: A hat turns into a little tax collector who inspects the Butcher’s pocket. This reinterpretation of shapes (which take almost the same position which they also have in the source image) seems to be Henry Holiday’s technique to leave traces for us to find the relation between his illustrations and the sources to which he alluded.